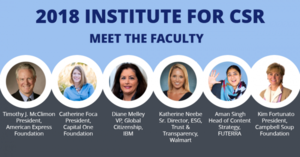 These faculty members lead some of the most impressive, well-established, and forward-thinking CSR programs in the world and bring their knowledge, skills, and networks to this practice-based professional certificate program. Read why Institute faculty Tim McClimon and Diane Melley invest their time and expertise in the program. The Institute for CSR, now in its fifth year, was designed by and for the CSR field as a practical, interactive, and affordable professional development opportunity. Over the course of four, two-day sessions, participants learn from some of the field’s most innovative thinkers, authors, and practitioners and expand their professional networks learning alongside CSR peers from across the country. Registration for the 2018 Institute is now open and classes begin in March. Learn more about the 2018 program and registration process here. The Institute for CSR is an initiative of the Washington Regional Association of Grantmakers and is offered in partnership with Advanced Academic Programs at Johns Hopkins University and the U.S. Chamber of Commerce Foundation’s Corporate Citizenship Center. The Institute, which is entering its fifth year, offers CSR practitioners the opportunity to earn a Professional Certificate in Corporate Social Responsibility from Johns Hopkins in just six months.